We encourage parent involvement and also work to establish lasting partnerships with community organizations. This combination of caring and high standards surrounds our students, parents and staffs – and excellence in teaching and learning is the result. ACE will incorporate service learning within a MicroSociety learning environment and seamlessly integrate this throughout the educational program. Evidence shows MicroSociety as well as service learning strategies provide a positive impact on learning. Program impact has been especially remarkable with those who struggle hardest to succeed – children from low income families, children with special needs, and children with limited English proficiency. Little Havana is a high minority community that the surrounding schools have not been able to meet Annual Yearly Progress with the following subgroups: Blacks and English Language Learners. Students learn the value of rules and laws when they create them, interpret them and enforce them in order to get along in their shared society. They also learn empathy and respect for others and hone valuable conflict resolution skills in order to get along in the progress of its evolution. By connecting curriculum to real-world activities, through a balance of intrinsic and extrinsic rewards, the program re-engages students who are disinterested in school because they don’t see its relevance to life. Students learn why voting is important and that demanding ethical decisions of their elected officials is not only their right, it is their responsibility. They witness firsthand how engaged citizens play a vital role in the success of a community and its ability to thrive. This innovative educational design is an incubator for the kinds of workers who will take the lead in running the businesses, government agencies, and charitable organizations of tomorrow. By linking real world activities to classroom learning, MicroSociety puts meaningful work into the experience of childhood. Students develop the critical 21st century skills like communications, critical thinking and decision-making, team-building, and personal initiative that will enable them to thrive in a global economy. Students uncover the fundamentals of finance as they buy and sell products in the marketplace, create personal and business budgets, maintain checkbooks for both, calculate taxes, and meet payroll. MicroSociety teaches financial literacy in a real world context that is meaningful to students. These practical challenges strengthen their aptitude math-related areas like banking, investment, and personal finance. Students come to recognize the value of a dollar and how to make more informed decisions about their own financial futures. To learn more about Microsociety, click here. The goal of the ESOL Program will be to ensure that all students entering Alpha Charter of Excellence with varying levels of limited English proficiency receive comparable and comprehensible instruction. 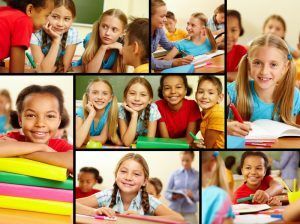 This instruction will help these students develop communicative and academic skills necessary for meeting national, state and district educational standards. All students who classify as English Language Learners will be provided an appropriate ESOL program to meet the specific student’s need in language learning, academic achievement and in cultural integration. To learn more about the ESOL Program, click here. At Alpha Charter of Excellence, we will identify and evaluate all children in the schools who may have special needs. We embrace the philosophy of personalized instruction and educate all students in the general education classroom when possible. Teachers accept responsibility for educating all students in their classroom, modifying and accommodating instruction as needed. Special education staff supports the regular classroom teacher with this process.Our knowledgeable staff is able to provide the individualized attention that each child needs to perform to his or her fullest potential, academically, socially and developmentally. We employ specialists and teachers as part of the school staff. Speech/language and OT are contracted services through a private provider. Please contact the office for additional information regarding ESE services and/or eligibility. For a list of ESE resources available through Miami-Dade Public Schools, click here. To be competitive, our students must have essential skills in computers and technology. Therefore, technology is an integral part of our learning experience. We provide cutting-edge technology in every classroom. Students have the opportunity to learn basic through intermediate skills in keyboarding and computer applications that provide a solid foundation for additional computer-based learning. I-Ready Reading and Math Program (K-5) https://cainc.i-ready.com/ – Built for the Common Core, I-Ready combines a valid and reliable growth measure and individualized instruction. The program provides: Adaptive Growth Measure & Diagnostic Test, Teacher-Led Instruction, Student Instruction & Practice and Reports for all Stakeholders. Reflex Math (K-5) https://www.reflexmath.com/RTI: Reflex has been used with success with a broad range of students and can be a vital part of any RTI mathematics program. Reflex meets the key requirements for an RTI solution and can serve students at all intervention tiers. It includes a multi-tiered system, universal screening, progress monitoring and data reports. 1. Fun, easy to use, and help students develop a deep understanding of challenging concepts through inquiry and exploration. 2. Research-based, flexible tools used by teachers across all 50 states in a wide variety of ways. Gizmos are ideal for small group work, individual exploration, and whole class instruction using an LCD projector or interactive whiteboard. 3. Designed to supplement your existing curriculum. Gizmos are correlated to state curriculum standards, the Common Core standards, and over 300 textbooks, making them easy to integrate into your instructional program.